We supply a wide range of Down The Hole Hammers (DTH) for the installation of Drilled Mini Piles. Mini Piling Plant Hire stock a wide range of DTH Hammers, Drill Bits, Shock Absorbers, drill rods, spanners and drive subs for delivery or collection nationwide. For installing DTH Drilled Mini Piles. 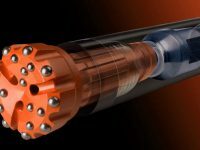 Drilled Mini Piles are used when underground obstructions such as rocks, boulders and mass concrete are expected, to penetrate hard strata to form a pile, or rock socket into a rock layer or bedrock. A Down The-Hole Hammer Drill or DTH Hammer is a pneumatically operated, self contained recipricating hammer designed to be screwed on the bottom of a drill string.